A comprehensive range of 3M informatory Signs and Boards can be availed from us at market leading prices. Available in different sizes as well as shapes, these can be customized in accordance with the client's specific requirements. Furthermore, these are manufactured using highly qualitative acrylic, a material which is known for its long life. We Manufacture all Kind of Retro Reflective sign boards for any kind of use. The sign boards are available as per the morth guideline. The post are painted, Galvanised as per the consumer needs. The sign board is availible for external and internal use. A wide range of Avery Dennison interior and exterior products to meet all retro-reflective, fluorescent and photo-luminescent requirements for high visibility road and interior signage. We offer a variety of lighted & non-lighted sign board that is fabricated using acrylic, PVC flex and polycarbonate. These are widely used in markets, highways and busy roads. Apart from this, these can also be designed for different brand and company names. In addition, these sign boards are enhanced with graphics and visuals. Theft preventive Road Signs, Road Signage, Over head signage, Direction Signage..all kinds of Signage available.Superfast delivery..Affordable pricing.Contact Now. 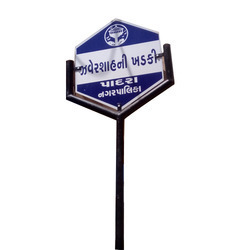 Being a most reliable organization, we are engaged in offering a wide range of Mandatory Traffic Signs Board. We offer a wide range of Traffic Gantry. Our Traffic Gantry come with warranties on aluminum substrates as per IRC & Sec 800 of Morth and are made using high quality material. The material used in their production are retro reflective sheeting of commercial/HIG/HIP/micro prismatic grades. 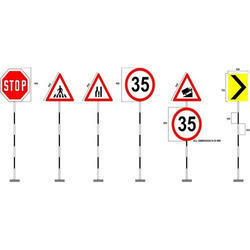 We are Leading Manufacturers and supplier of Traffic Signs.